Forget-Me-Not or Myosotis Scorpioides are small flowering plants belonging to the family Boraginaceae. They are native to northern hemisphere or New Zealand, but are now common in temperate latitudes as well. These plants spread easily and are self-seeding just like the many strains of poppy plants. They will scatter themselves throughout the garden floor perennially to grow leaves in the first year, once mature they will bloom in the second year. They will surface themselves anywhere that you will find a handful of earth, this makes plants like these show up out of the blu. There self germinating is why plants like these, crop up out of know where, and this is why they are such a low maintenance addition to any garden. These delicate plants have little blue flowers with yellow eyes. There are varieties with white, pink or yellow flowers too. The flowers are produced on long hairy stems during spring and it extends to early summer. The plant height is limited to 6-12 inches and can spread to 1-foot wide that is 30cm. The flowers have five petals and are about 1cm in diameter. These plants love to grow in woodland settings near ponds, streams and brooks, as they prefer moisture and humidity. They grow well in pots and can be used as edgings or a groundcover in the garden. They also form good cut flowers. These short-lived plants are prone to the attack of slugs. They are remarkable biennial plants and should not be overlooked. The flowers are extremely dainty and really grow well in shady spots in the garden. They call for high moisture and humidity for survival and flowering. Though they thrive well in damp and shady areas, they are tough enough that they can also withstand full sun exposure certain times a day. Plants grown in drier areas require watering. As they love moisture and humidity makes them ideal for landscaping close by a bog or pond area. They will survive well, even in average soils if you keep that soil a little bit moist. The soil should be well draining. The Forget-Me-Not Plants can be inter-planted with spring tulips to give a magical effect to the garden. It is easy to grow Forget-Me –Not Plants and they are popular giveaways as posies for funeral services, sales promotion, and political campaigns or sold along with daylilies at Chinese markets. These plants do not require much attention and care once planted. 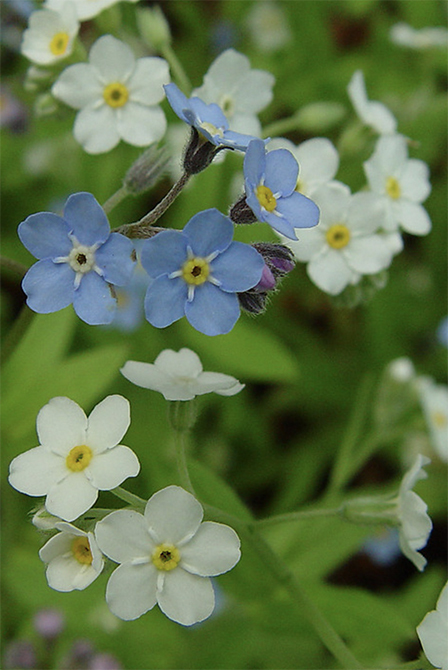 Forget-Me-Nots require feeding with general-purpose fertiliser once or twice during the growing season. In regions with a Mediterranean climate, the plant should be protected from extreme winter by mulching. While planting, ensure that there are 4-5 inches of space between the plants. If required thin out the seedlings at least 10 inches apart. Propagation of Forget-Me –Not can be made using the seeds or by division of the clumps. The seeds should be sown in the garden bed once the danger of frost is over. If you want to make the plants bloom earlier, you can try starting the seedlings indoors at least a few weeks before the last frost. Sow the seeds outside when the danger of frost is over and cover the seeds lightly with garden soil. Ensure that the soil is only 1/8 inches in thickness. Thinning of seedlings to create a space of 10 inches between the plants promise proper growing space. The seeds will take 8-14 days for germination. The established plants can be divided to create new plants. Before transplanting the seedlings started inside, acclimatise them slowly and plant them outside. This plant is vulnerable to powdery mildew before it dies out after the flowering season. To ensure re-growth in the following year you should allow the plant to set seed. Insect attacks and diseases do not trouble these plants much. If there is any problem with insects and diseases you can opt for insecticides or fungicides.